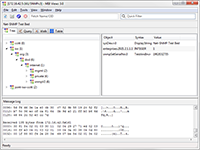 Network Management Software, Services & Consulting | Muonics, Inc.
Save time and money on your next SNMP MIB design using our Visual MIB Editor and Compiler for Windows, Linux, FreeBSD, Solaris, and Macintosh. Low cost, entry-level MIB Browser for exploring low level SNMP Agent data on Windows, Linux, FreeBSD, Solaris, and Macintosh. Supports SNMPv1, SNMPv2c and SNMPv3.